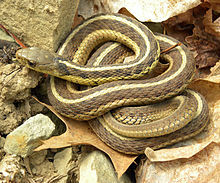 The Common garter snake (Thamnophis sirtalis) is an indigenous North American snake foond widely athort the continent. Maist garter snakes hae a pattern o yellae stripes on a broun or green backgrund an thair average length is aboot 55 cm (22 in), wi a maximum length o aboot 137 cm (54 in). The average body mass is 150 g (5.3 oz). ↑ Conant, Roger. 1975. A Field Guide to Reptiles and Amphibians of Eastern and Central North America. Houghton Mifflin. Boston. This page wis last eeditit on 4 Februar 2017, at 22:51.